Have you ever experienced that perfect partnership in something you use? Maybe it is a favourite food combination like peanut butter and jelly, or even an artistic combination like canvas and easel? Over the past year I have really enjoyed drawing on black paper: it gives an extra dimension to your art and avoids the fear of the ‘white space’. That said, working on black paper is not as straightforward as you would imagine! As coloured pencils are a translucent media, the black of the paper changes their hue quite considerably. One way that many answers to counteract this is by using a layer of white pencil underneath, known as underpainting. As an artist that likes to experiment and push the boundaries of what a pencil can truly achieve, I have had so many wonderful discoveries but also many disasters too. 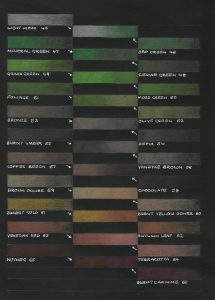 When I am putting a new pencil range to the test, I like to make colour charts and swatches on the surface that I am wishing to use. 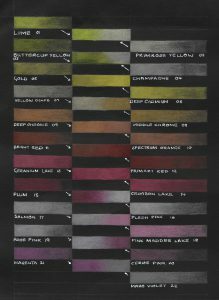 When working with Derwent Procolour, this colour chart began on black paper. 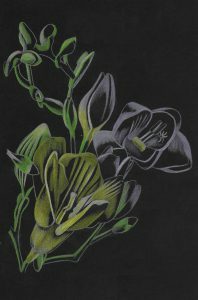 I personally enjoy using Derwent Black Paper as, although it feels really smooth, it can actually take many layers which enables the artist to ‘glaze’ with their coloured pencils. To describe ‘glazing,’ it is when each layer applied is done in a light hand which allows the translucent quality of the pigment and wax binder to show through each subsequent layer. By using this technique we can create many hundreds of different shades with the pencils in the tin. 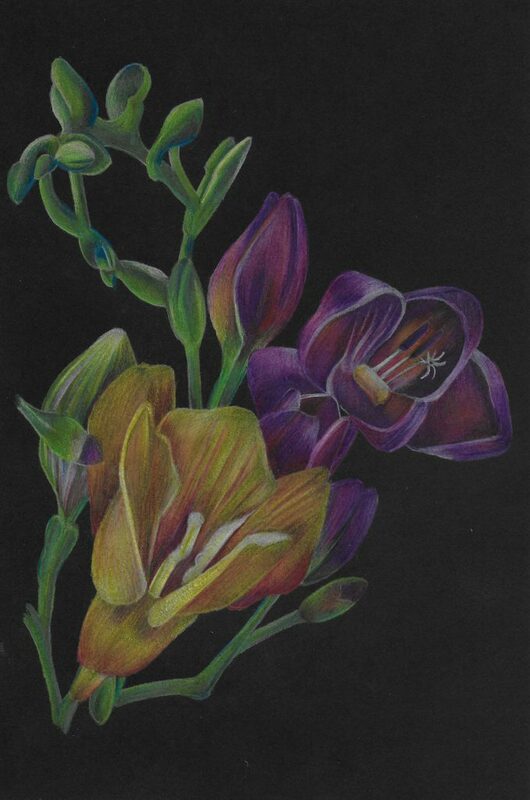 And my ‘Eureka moment’ came recently when I was using Derwent Procolour pencils. 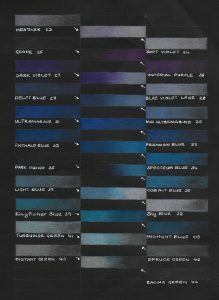 When I was creating my colour charts, I found that because the pigments are so intense that I actually did not need to underpin with white at all. The colours stayed true to their original appearance and were not altered by the black underneath! Normally, when you use a yellow pencil on black it can appear green but the use of a layer of white underneath helps to improve the colour correction and bring out the true yellow. 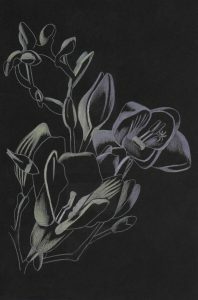 On black paper, Procolour stayed yellow – despite me not layering white down first. 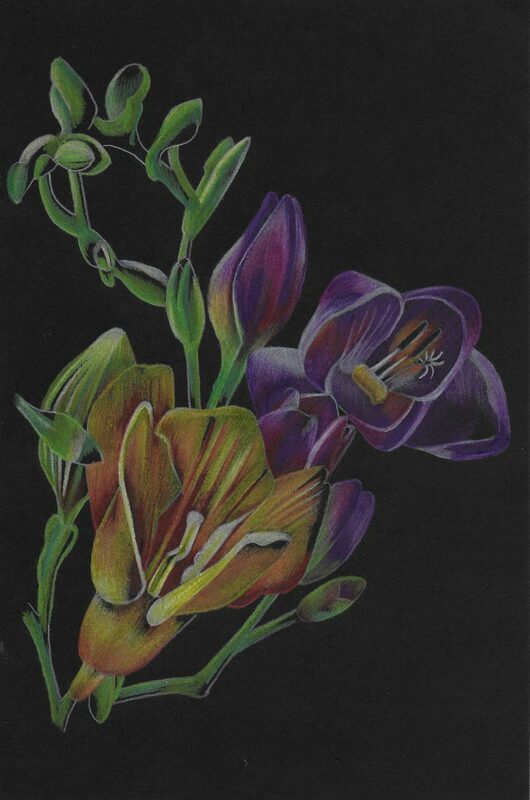 I believe that because the Derwent Procolour pencils are so laden with high-quality pigment that I will actually never have to spend many hours underpainting in white first and, as any coloured pencil artist will relate to, it can often take hundreds of hours to create coloured pencil art – so any time saving is a bonus. As the pigment in the pencils is so intense, it also means that I did not need to use as many layers to obtain the colour saturation that suits my artistic style. For me, Procolour are definitely the first pencil that comes from my art box when working on a coloured background paper – nothing else quite compares to them! An extra little tip: keep your pencils point sharp to avoid burnishing or flattening your paper too early and apply your layers with a light hand! 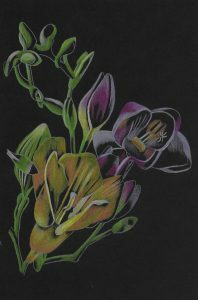 Judith Selcuk is a member of the UK Coloured Pencil Society, The Association of Animal Artists and the SAA.